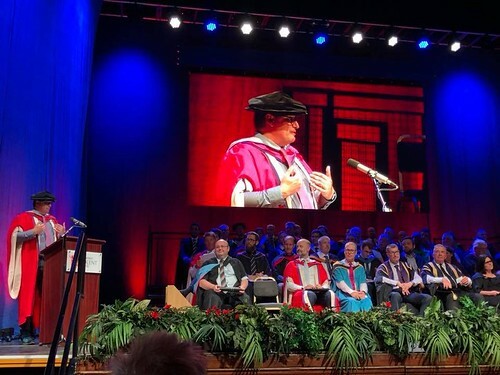 My job that day was to join in with the rest of the academic body on stage and congratulate each of the 600 graduating students with a round of applause from the stage. Then I had my citation read out and the Chancellor handed me my tube and conferred the honor. Then I had a free form 5 minutes to talk to the students and families about the wonderful opportunities out there for them all. This part was the biggest honour of the day as a graduation day is a rare and special time. I talked a little about Choi Kwang Do and the milestones that we have in martial arts, and how getting a belt doesn’t mean stopping practicing and learning from the previous belts, its ongoing to learn and practice and the journey really does matter more than the destination. I also implored everyone to share and work together and most of all be nice, all the time if possible! 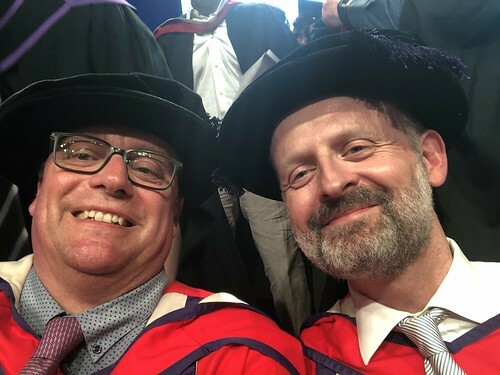 Also with me in gaining a Doctorate was Mark Sanger, Oscar winning film editor on Gravity (amongst many other fantastic films). He became a Doctor of Art. He gave a really good speech, and we commented afterwards how we said very similar things in different ways, which I hope helped get re-enforce our enthusiasm for getting on out in the World. The university link is here but I am adding int he video from that page of the mini interview and roundup that the team did and put up really quickly!